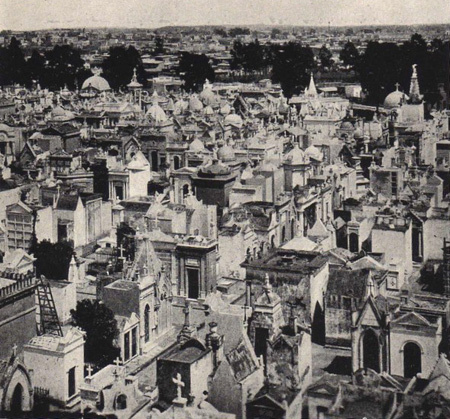 Avid world traveler Frank G. Carpenter gets credit for this photo of Recoleta Cemetery. Included in the 1923 book The Tail of the Hemisphere: Chile & Argentina, Marc of Asado Argentina kindly scanned this for me along with many other wonderful photos of Buenos Aires in the 1920s. Thanks! In the Recoleta Cemetery, the dead sleep in little marble palaces. It is divided into paved streets with the homes of the departed, a house and a lot for each rich family and humbler, more congested quarters for the poor. A stunning photo for the lack of edification around the cemetery—dozens of tall buildings surround it today—much has changed inside the cemetery since then as well. After staring at this photo for 20 minutes, I found two landmarks which finally allowed me to pinpoint the location from where it was taken… the bell tower of the Iglesia de Pilar. That’s really cool. Great glimpse back in time. I very much like “the dead sleep in little marble palaces.” Great picture. Look at all those huge trees in the background. I’ll have to search for more historic pix of the cemetery. Too bad all those trees have been replaced by high-rise apartments. The book is a fantastic read and I think there are quite a few editions for sale online for cheap. (It’s in Google Books but you can only see excerpts of what you search for) You really get to see the mentality, expectations, and speculations at the time–well through his eyes. I don’t think the book could have been written at a better time. If you do a “then and now” I’ll pass along some architectual exerpts, but I’m sure you already know most of them through all of your research. Marc – There is so little travel photography from that time, so it becomes an incredible resource… a snapshot of the era. I’ll see if I can find a copy for sale online & have a friend ship it to BsAs. But that’s not to say there aren’t errors. His last quote you listing could never be true. All the tall buildings downtown from the 1890s wouldn’t be there because the streets are only 3-cars wide! But that’s ok… I like it more for the view during the heydey of BA. “The Tail of the Hemisphere – Chile & Argentina” by Frank G. Carpenter is a wonderful master piece of sound description of the social, economic and historical situation in those countries. I have the leather bounded publication and will treasured it for many years to come. Hopefully I’ll find a copy myself one day! The photography is priceless. Saludos!